A light and creamy Greek themed feta and dill dressing. Looking for a new salad dressing? How about this creamy feta and dill dressing? This dressing gets it’s creaminess from a combination of greek yogurt and milk so it’s nice and light and healthy. It’s packed full of tasty crumbled feta and fresh dill for the main flavours and it has a hit of lemon juice for some extra tanginess. 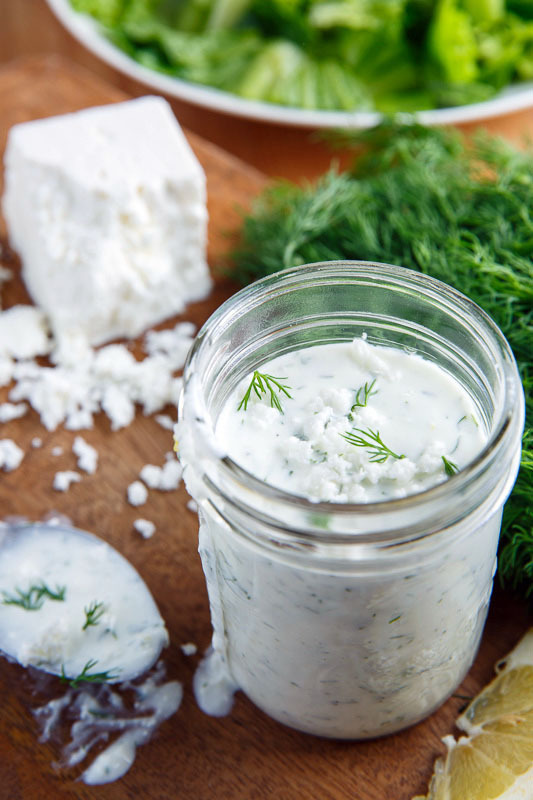 This creamy feta and dill dressing goes perfectly on Mediterranean themed salads, basic salads and cucumber salads and no matter what salad you use it on, it won’t be boring! Option: Add grated cucumber for a thicker, more tzatziki like dressing. Loving the feta in this recipe! I have the perfect salad to try this with. Pinned! This is a terrific homemade recipe for a restaurant favorite! We can’t wait to use is on our Greek salads soon. What brand of greek yogurt do you like to use in this? We love Fage and Stonyfield! I've tried quite a few of your recipes. This I've tried recently and have been making it for our green salad, instead of vinegrette.